A group of Engineering students have launched a new project to showcase everyday marvels of innovation as part of the Sheffield Festival of Science and Engineering 2017. Available until 31 March 2017, Engineering 360° is a series of videos that people can watch on their smartphones as they walk around the city. Created by students from the Sheffield Engineering Leadership Academy (SELA), the 360° videos use virtual reality technology to reveal how engineers create the world around us. Each video focuses on a distinct area of engineering, something that the organisers hope will help to challenge people’s perceptions of what modern day engineering is. Ronak Sharma, one of the SELA students involved in the project, said: “Engineers create the world around us, but most of the time, we don't stop to think about it. The idea behind Engineering 360° was to give people a real sense of life through an engineer’s eyes. The project forms part of the wider Sheffield Festival of Science and Engineering, a series of free events designed to inspire the general public with world-class research and ideas from the fields of science, technology, maths and engineering. This diverse programme consists of over 50 events taking place all over the city during March 2017. Users will need to scan a QR code on their phone to access the Engineering 360° videos, which form a trail around the university campus. 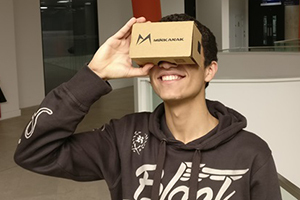 The SELA students are also hosting a ‘behind the scenes’ event at 5:30pm - 7pm on 24 March in the University’s Diamond building, where they will be giving away free virtual reality headsets to visitors. Gary Wood, Head of SELA said: "Engineering 360° was conceived, designed and created by our Sheffield Engineering Leadership Academy students. They worked extremely hard to develop the concept and produce the films, and as a university we’re immensely proud of what they’ve achieved together, in helping to make engineering more accessible and visible."